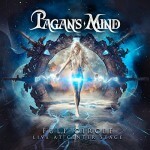 Share the post "Album review: PAGAN’S MIND – Full Circle Live at Center Stage"
I have come quite late to the Pagan’s Mind party having first heard them on their 2011 release, ‘Heavenly Ecstasy’. Hailing from Norway, they play progressive metal or space metal as some have dubbed it. This show was recorded at 2014′s Prog Power USA to celebrate the band’s first appearance at the same festival back in 2003. The idea at the 2014 show was to play all of their 2002 album ‘Celestial Entrance’, which takes up disc one of the CD and then the second disc is a mix of their regular live set. The ‘Celestial Entrance’ is spot on, the band play incredibly tightly and vocalist Nils K Rue has an amazing set of pipes on him. The second disc I am more familiar with some of the songs including a sterling version of ‘Live Your Life Like A Dream’ and ‘God’s Equation’. They even do a decent cover of David Bowie’s ‘Hallo Spaceboy’, a song made for the band’s love of all things space. There are some classy keyboard runs and solos from Ronny Tegner, whilst guitarist Jørn Viggo Lofstad reels solo, after solo off effortlessly and is one of the best guitarists in this genre. This entry was posted in ALBUM REVIEWS, ALBUM REVIEWS (Mobile), All Posts and tagged album, CD, DVD, Full Circle Live at Center Stage, metal, Pagan's Mind, progressive, review. Bookmark the permalink.